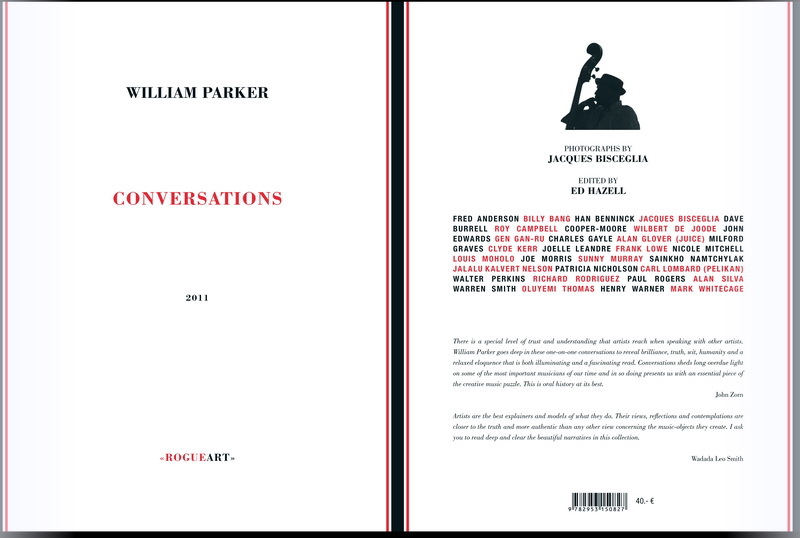 William Parker pubblica per la francese Rogue Art un nuovo libro che raccoglie dichiarazioni e interviste raccolte negli ultimi dodici anni parlando con musicisti amici e colleghi: Conversations. Nel corposo volume, oltre a una trentina di pagine di fotografie di Jacques Bisceglia, c'è anche un cd audio con alcuni passaggi tratti dalle interviste e brani in solo dello stesso bassista. Jazz bass great William Parker, a musician's musician and a canny conversationalist – delivering a terrific book for Rogue Art featuring interviews he conducted over a 12 year period – conversations with Fred Anderson, Billy Bang, Han Bennink, Dave Burrell, Frank Lowe, Nicole Mitchell, Sunny Murray, Louis Maholo, Alan Sliva and many more! The discussions focused on four main areas: sound; the multi-dimensional aspects of the musicians as human beings who are thinkers, philosophers and healers who have an affinity for other arts and sciences; recollections of the 'scene'; and family background.The book is paperback, 443 pages, with that sparely beautiful Rogue Art white, black & red design, with a section of color and b&w photographs by Jacques Bisceglia. Definitely a rare treasure – with a report that could really only happen from one musician to others. Edited by Ed Hazell. It comes with a CD, too – featuring excerpts of the interviews and some William Parker bass solos. The CD is 68+ minutes.